We welcome all to join us throughout the year at our Liturgical Services and especially during Great Lent and Holy Week leading up to the Glorious Feast of Great and Holy Pascha. If you cannot attend a service but would like to still participate, please consider joining us online via our live broadcasts page. View our Holy Week Service Schedule with Details below. Learn more about Lent, Holy Week, and Pascha. Paschal Festivities in the Church Hall following. Joint Agape Vespers (Baouth) 11 am at St. John of Damascus Church Dedham, MA. It is preferred that you make your confession before Holy Week. The Church Parking Lot WILL BE AVAILABLE for parking throughout Holy Week; however it is NOT AVAILABLE for parishioner parking Mon–Thurs from 9 am to 5 pm. Remember to return your Food For The Hungry boxes and canisters, filled with money, and pass them in at the Bengarri this Sunday, April 21. There will be no Church School classes this Sunday. 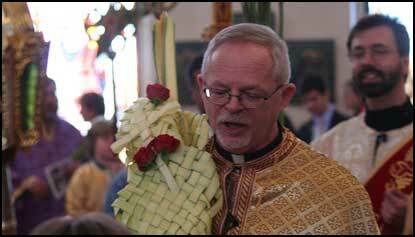 Following the Liturgy there will be the Procession with Palms (no lighted candles, please). All who wish to do so are invited to join the procession; children are especially encouraged to participate. Join us for our Annual Palm Sunday Fish Dinner after Liturgy. Instead of cooking, spend your Palm Sunday with your family and friends in Church. Reservations are not required; thanks to the generosity of a parishioner, there will be plenty of food. A freewill donation will be happily accepted, but there is no set price for this dinner. On Sunday, Monday and Tuesday evenings, April 21,22,23, there will be a Bridegroom Matins service at 7:00 pm. On Holy Tuesday morning, there is a Presanctified Liturgy scheduled at 7 am. Confessions - During Holy Week Fr. Antony is available for Confession before and after services from Monday to Wednesday evenings only, or by appointment. Please note that no confessions will be heard on Great and Holy Saturday before the Rush Procession. The evening service on Wednesday, April 24, is Holy Unction. The service includes seven Epistles, seven Gospels, and seven prayers, all about oil and healing and forgiveness and the Holy Spirit. Seven wicks are lit in the bowl of oil, and at the end each of us is anointed and given Holy Oil to take home. On Thursday, April 25, Vesperal Liturgy is at 7:00 am. The evening service begins at 6:45 pm. with Washing of the Feet, followed at 7:00 pm. by Twelve Gospels, in which we hear by candlelight the entire story of Christ’s final teaching, passion, trial, walk to Golgotha, crucifixion and burial, from all four of the Gospel writers. Royal Hours begins at 1:00 pm, followed by Unnailing Vespers at 3:00 p.m., when the figure of Christ is removed from the Cross, where is was nailed Thursday during the Twelve Gospels service, and is laid in the tomb, or bier. Lamentations begins at 7:15 pm. this year. During this service we will process with the Bier out of the church and down Massachusetts Avenue to Central Square , where we will meet worshippers from Ss. Constantine & Helen Greek Church carrying their bier, and join them for prayers and blessings before processing back to St. Mary. Help Decorate The Church - Your help is needed on Great and Holy Friday at 9:00 am. and on Great and Holy Saturday after the Liturgy and Coffee Hour at 1:00 pm. We will be preparing and decorating the Bier and Church for Pascha. Please come, stay and help. Be sure to sign up and participate in the Vigil Friday night and into Saturday morning. Volunteers, keeping vigil over the tomb of Christ, will take turns reading from the Bible throughout the night. Vesperal Liturgy of St. Basil begins at 9:00 am. on Saturday, April 27. We commemorate Christ’s triumph over evil and death, with the scattering of bay leaves and flowers. This service includes fifteen lessons from the Old Testament, all prophesying the ultimate victory of God, and also includes Baptism and Chrismation of our eight catechumen. The Liturgy will be followed by a Coffee Hour/Reception.